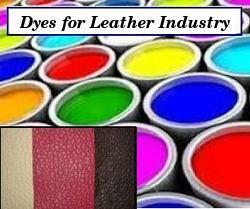 Providing you the best range of dyes for leather industry with effective & timely delivery. By utilizing modern machines and latest equipment, we are engaged in offering an extensive range of Dyes for Leather Industry to meet the needs of our clients. For the benefits of our clients, these dyes stringently tested on various parameters and are authenticated as per the international standards. These products are highly efficient and needs low maintenance. We are offering these dyes at economical rates. Looking for Dyes for Leather Industry ?